A performance can be true to the composer's intentions, yet sound quite different from the composer's own performance of it. I'm always happy to hear my own music played in a way that is different from how I play it myself, so long as it still gets the essential musical point(s) across. Many of my pieces can still 'work' with different details (tempi, articulations etc.) from how I originally wrote them down. And over time, I change even these details in my own performances. Conversely, a performance can be highly detailed in many ways, yet somewhat miss the essential musical point(s). So how do you distinguish between the important details, which are necessary--- true *intentions* on the composer's part, and the incidental ones, which can be swapped out either based on a person's particular playing style or the circumstances of a particular concert---- often incorrectly called *intentions*, but maybe better referred to simply as the composer's *expectations* at the time s/he wrote it? Any simple, black-and-white ideological lens through which to look at everything will eventually produce absurd results in some instances. Even such a basic laudable goal as 'making a piece sound the best it can' may actually go against the composer's intent, if, for example, the piece is meant to be a technical study. Certainly some of the most difficult moments of Kreutzer and Paganini etudes would sound better if they were simplified---- certain slurs shortened, certain double stops rewritten, certain passages played in lower positions that sound clearer--- but then the music has also been gutted of it's raison d'etre, its reason for existing in the first place. Take staccato as an example. In an etude about staccato, you need to play at least a fair amount of staccato. Also, performing a completely staccatoless Hora Staccato (by Dinicu) makes no sense as it is one of the central points of the piece. However, leaving out a couple of staccato runs in a concerto might be perfectly reasonable, since they're fairly peripheral. Nice if you have it, but not a big deal if you don't. In short, it's the musical context of the work that provides the clues as to what's important and what's not, and there's no simplistic way to find that out without knowing a fair amount about the purpose of the piece and the construction of music in general. Some composers are undoubtedly fussier than others, however I've never run across such indiscriminate fussiness as I have with some performers themselves, probably in an attempt to outdo one another with the most 'authentic' performance, usually of music by long-dead composers. This has become a Classical musician stereotype. Probably because both of my parents were professional musicians, I grew up viewing 'Classical music' as living music of my own time---- not a window into an idealized past or a recreation of an historical event. I just saw it as music, usually great music. Most performers before the 20th Century were also composers, and because of this I think they could more easily separate important details from less-important ones. By the 20th Century, however, we had such specialization that many performers were not trained in composition at all, and (in my opinion) this partially gave rise to the HIP movement, which filled a void in providing answers to legitimate musical questions---- just with historical answers. So we got ourselves to a place where between endless scholarship, historical recordings etc. we have at our disposal more alleged "composer's intentions" than at any other time in history. Yet, this is exactly what can rob a performance of creativity, personality, and an appropriate adaptation of the work to the circumstances under which it is actually being performed--- because only a subset of them are actually the composer's true *intentions*. Many (most?) are just *expectations* of the time and fairly irrelevant to the composition. I see more and more performers writing and arranging music today than I did when I was a kid, and I can see the pendulum heading back toward a more reasonable center. I wouldn't want this blog post to be viewed in any way as a plea for relaxed standards; in some ways it's actually for higher standards and an argument against a free-for-all approach to interpretation in cases where it's inappropriate. It's an argument for a balanced perspective of music based on the musical considerations of what's important in the specific piece at hand, not on a one-size-fits all, ideological approach. January 28, 2019 at 08:21 PM · Great piece! Thought provoking. January 29, 2019 at 02:14 PM · Thanks for this. 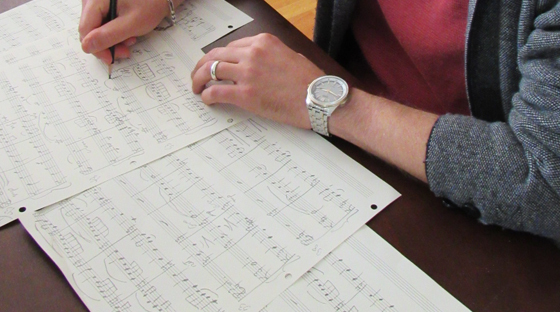 Nice to hear a composer's perspective on being true to his or her musical intentions. January 31, 2019 at 06:01 AM · Two thoughts: Composers and arrangers should not try to choreograph bowing. Instead they should just write how they want it to sound, the articulations, and let the soloist or concertmaster figure out how to do it. Likewise, the performer should not interpret the articulation markings; slurs, dots, dashes, etc., as bowing instructions. It would be absurd to play the intro to Brahms symphony mvmt. 1 in one long slow bow. January 31, 2019 at 03:11 PM · It is one thing to interpret the work of a long deceased composer as opposed to one who is still quite alive. That being noted, as the author of a number of technical papers during my professional (not musical) career, I learned early on that once you put something out in the public domain, you pretty much lose control of it. The conductor will see/hear something that the composer didn't see or possibly intend. If there is a solo part the performer will interpret that through their personal knowledge and experience. Of course, long dead composers are a lot easier to interpret because most of them did not leave a long set of instructions along with the sheet music (much of which has been printed and re-printed over the years and minor errors/changes creep in). We will never be sure of the initial intent of the ancient composers and the interpretation of new works will still happen. February 2, 2019 at 02:46 AM · I enjoyed a relatively modern recording of Prokofiev's Romeo and Juliet - it was lovely and sounded good. Then I heard a much older, poorer quality recording conducted by the composer - to this day, I'm impressed by the vitality and drama of the performance conducted by the composer, and dismayed that the more modern performance didn't capture it.